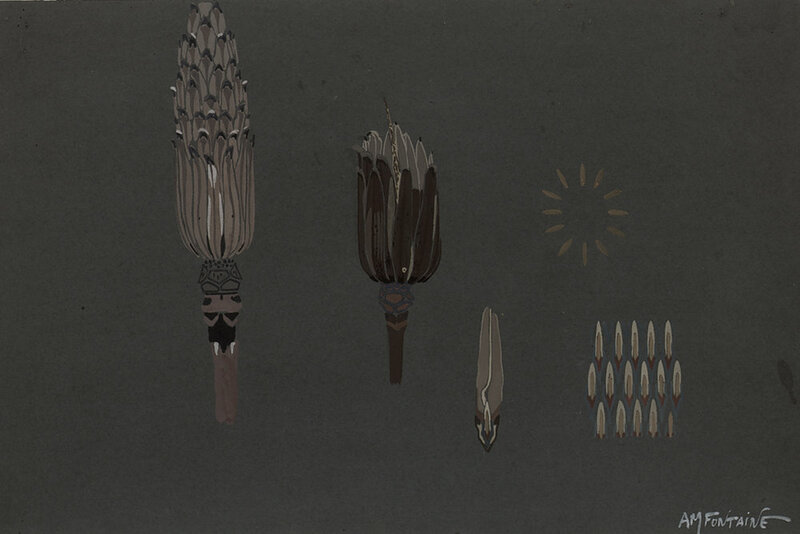 Jean-Guillaume Moitte was born in Paris to an artist father, Pierre-Etienne Moitte. From 1761-64, he trained under the sculptor Jean-Baptiste Pigalle and then transferred to the Atelier of Jean-Baptiste Lemoyne, the favorite sculptor of King Louis XV. 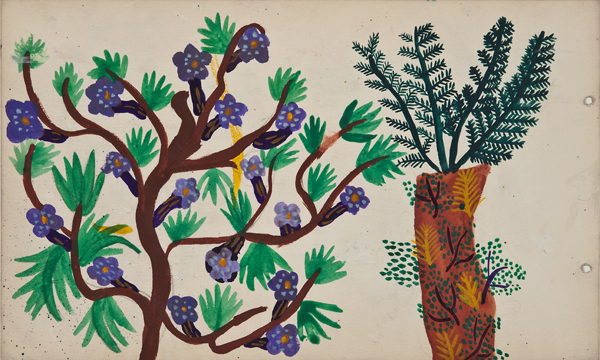 Despite this training and various important commissions, the period that most influenced Moitte’s oeuvre was his time at the Académie in Rome. Here he studied Roman reliefs, vases, urns and sarcophagi, and it was this concentration on the art of antiquity that inspired him on his return to France. Following his return to Paris, Moitte is said to have executed plus de mille dessins de ce genre for the celebrated goldsmith Henri Auguste. 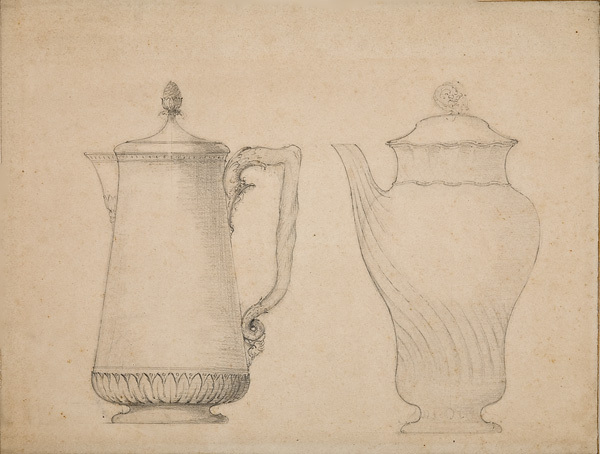 Moitte’s classically inspired drawings contributed much to the development of the Empire style in metalwork in which Auguste’s oeuvre played an important role. 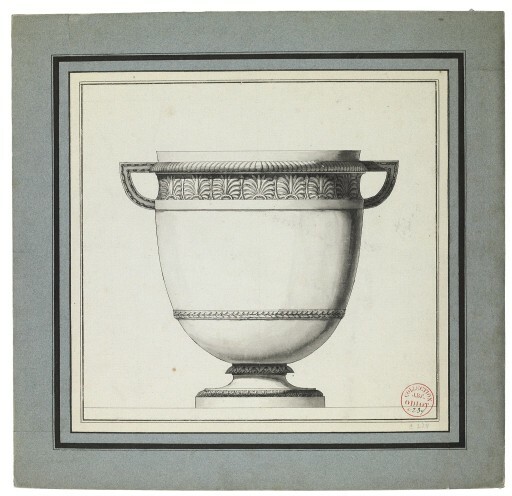 Jean-Guillaume Moitte, French, 1945-1810, Design for a silver wine cooler with a frieze of palm leaves, black lead, pen and grey ink wash, 16 3/4 x 17 1/2”. Sold. 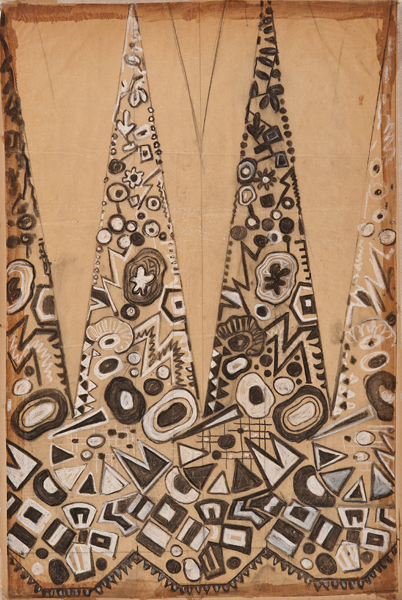 Jean-Guillaume Moitte, French, 1945-1810, Design for a silver tazza with an elaborate frieze of cornucopiae, black lead, pen and grey ink wash, 9 7/8 x 20 3/8”. Sold. 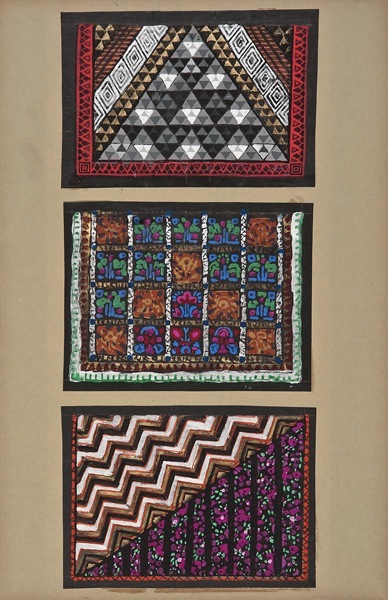 Maurice Leonard, Lyon, 1899-1971, Three textile designs, early 20th c., gouache, 19 3/4 x 9 1/4"
Emile Didier, Lyon, 1890-1964, Lace design, gouache, 19 x 12 3/8"
Louis Brocard, French, active 1870s-1910s, Design for a cafetière [coffee-pot] - two versions, early 20th c., graphite, 8 1/4 x 11"
Louis Brocard, French, active 1870s-1910s, Design for a teapot, early 20th c., graphite, 8 1/4 x 11"
Anne-Marie Fontaine, French, d. 1940, Design for Sèvres Porcelain, c. 1930, gouache, 14 1/2 x 21"
Par l’atelier de Sarreguemines à Digoin, Tiles: Trois projets de panneaux muraux en céramique, c. 1900-1910, ink, watercolor and gouache, 16 x 21 5/8"
Paul Poiret was the first of the fashion celebrities. Poiret ushered in the 20th century woman, outlawed the corset and in his own words 'freed the breasts and shackled the legs'. Poiret's clothes were revolutionary and modern. 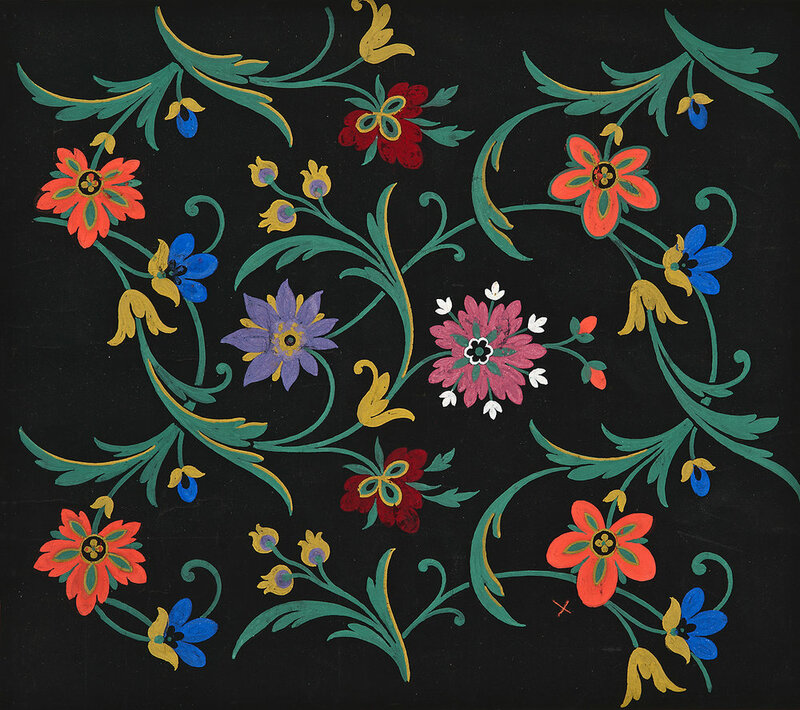 Martine Le Cours Pour Maison Paul Poiret (1879-1944), France, Design Project: Parrot, c. 1910, pencil and gouache, 11 x 14 1/4"
Martine Le Cours Pour Maison Paul Poiret (1879-1944), France, Design Project: Anemones, c. 1910, pencil and gouache, 11 x 14 1/4"
Martine Le Cours Pour Maison Paul Poiret (1879-1944), France, Design Project: Sunflower, Balloon Flowers, and Astible, c. 1910, pencil and gouache, 11 x 14 1/4"
Martine Le Cours Pour Maison Paul Poiret (1879-1944), France, Design Project: Purple Nightshade, c. 1910, pencil and gouache, 11 x 14 1/4"